Everywhere the same question: Who will rule Russia? If a triumvirate, can it long endure or does the Soviet structure demand a single head? Will there be orderly elimination or violence? If violence, is there a man in Russia able to use war on his colleagues, win and consolidate supreme power, and, through it all, hold together the Union and the Empire? There are no answers yet. There may not be for a long time. But there will be hints. And to evaluate the future’s clues, to perceive the drama behind them, we will need to have the past fresh in our minds. For this drama was played once before. Then, Lenin was god and Stalin the mythmaker; now Stalin is the omnipresent myth and the new chief priest has not yet been ordained. In 1922, Lenin, who had made possible Stalin’s rise from obscurity, already distrusted his ability, his methods and his ambition. 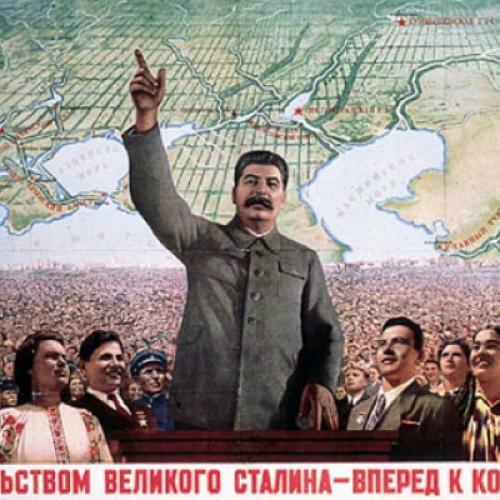 But after Lenin’s death, Stalin energized and exploited the “Lenin Myth” to seize supreme power. Today there is a “Stalin Myth.” And any man who hopes to rule the Russian Empire will probably seek to use it as a cloak. In order to help our readers understand the similarities and differences in the two dramas, and thus to correctly estimate the action behind the hints we have excerpted the following material from Stalin: A Political Biography, by Isaac Deutscher (Oxford University Press). IN THE FIRST WEEK of February, 1923, Lenin dictated his article “Better Less But Better,” a devastating attack on Stalin as the Commissar of the Inspectorate. This was Lenin’s first, publicly delivered, blow. Behind the scenes he prepared for a final attack at the Twelfth Party Congress, convened for April; and he agreed with Trotsky on joint action. On March 5 he had a sharp exchange with Stalin. He then dictated a brief letter to Stalin, telling him that he “broke off” all personal relations with him. Just in the middle of these moves, on March 9, he suffered the third attack of his illness, from which he was not to recover. Meanwhile, Stalin displayed modesty and simple-minded devotion to Lenin. Such postures shielded him from a good half of the charges leveled against him. Hoping for Lenin’s recovery and believing that their joint action would be more effective than his own solitary effort, Trotsky bided his time. Meanwhile Stalin acted. It was about this time that a triumvirate, composed of Stalin, Zinoviev, and Kamenev, formed itself within the Politburo. What made for the solidarity of the three men was their determination to prevent Trotsky from succeeding to the leadership of the party. Separately, neither could measure up to Trotsky. Jointly, they represented a powerful combination of talent and influence. . . . As the other members of the Politburo walked each his own way, the triumvirs automatically commanded a majority. With the scene so set, Stalin had little to fear from the congress. . . . The triumvirs evaded the issues raised by Trotsky and charged him with malevolence, personal ambition, neglect of his duties in the government, and so on. . . .
TROTSKY APPEALED to the youth; and, as if pointing to the triumvirs, the “old guard” of Bolshevism, he warned the party that revolutionary “old guards” had not rarely degenerated into bureaucrats. This had happened with the leaders of reformist Socialism in Europe; and it might happen with Bolsheviks, too. . . .
On January 21, 1924, Lenin died. Despite all the miseries and disappointments of recent years, he was mourned by the people as very few leaders in history have been mourned. In the popular mind his name still stood for the great promise of the revolution, the society of equal and free men. The mourning crowds were already turning uneasy eyes on his disciples: which of them would take his place at the helm of the state? In spite of recent squabbles and excommunications, the thoughts of many went out to Trotsky. But he was not to be seen at Lenin’s bier, at which the crowds paid their last homage to the deceased leader as he lay in state, or at numerous memorial meetings. Trotsky had gone to the Caucasus to have his illness treated; and, if his own testimony is to be believed, he failed to return for the funeral in Moscow because Stalin had misinformed him about its date. On the scales of history, it may be said, the incident weighed but little. But the fact is that in those days the triumvirs, and not Trotsky, impressed themselves upon a popular imagination stirred by prolonged and elaborate funeral ceremonies. Skillful stage management turned the limelight on the triumvirs as they were symbolically stepping into the breach. The elaborate ceremony was altogether out of keeping with the outlook and style of Lenin, whose sobriety and dislike of pomp were almost proverbial. The ceremony was calculated to stir the mind of a primitive, semi-oriental people into a mood of exaltation for the new Leninist cult. So was the Mausoleum in the Red Square, in which Lenin’s embalmed body was deposited, in spite of his widow’s protest and the indignation of many Bolshevik intellectuals. The process was inevitable. The abstract tenets of Marxism could exist, in their purity, in the brains of intellectual revolutionaries, especially those who had lived as exiles in Western Europe. Now, after the doctrine had really been transplanted to Russia and come to dominate the outlook of a great nation, it could not but, in its turn, assimilate itself to that nation’s spiritual climate, to its traditions, customs and habits. Imperceptibly, the process had been going on for some time. Nobody had had a deeper insight into it and felt more embarrassed by it than Lenin. His own death was the catharsis which relieved many of his disciples from the inhibitions of pure Marxism. It revealed the degree of the mutual assimilation of doctrine and environment that had taken place so far. IT WAS PERHAPS NATURAL that the triumvir who had spent his formative years in a Greek Orthodox seminar should become the foremost agent of that change, that he should give the fullest expression to it. The oath to Lenin, which he read at the second congress of the Soviets, remains to this day the fullest and the most organic revelation of his own mind. In it, the style of the Communist Manifesto is strangely blended with that of the Orthodox Prayer Book; and Marxist terminology is wedded to the old Slavonic vocabulary. Its revolutionary invocations sound like a litany composed for a church choir. Meanwhile the one text of Lenin that might have removed the earth from under Stalin’s feet, his will, was still unknown to the party and to himself. Only in May, four months after Lenin’s death, was it read out at a plenary session of the Central Committee, which was to decide whether the document should be made public at the forthcoming congress of the party. Zinoviev’s motion that the testament should not be published, but only confidentially communicated to picked delegates, was then passed by 40 votes against 10. Stalin could now wipe the cold sweat from his brow. He was back in the saddle, firmly and for good. The solidarity of the triumvirs stood this extraordinary test because both Zinoviev and Kamenev were as convinced that they had nothing to fear from Stalin as they were afraid of Trotsky. Both looked upon Stalin as upon their auxiliary; and, though they were sometimes uneasy about a streak of perversity in him, neither suspected him of the ambition to become Lenin’s sole successor. Nor, for that matter, did any such suspicion enter the mind of the party as a whole. The very thing which under different circumstances would have been a liability in a man aspiring to power, his obscurity, was his important asset. The party had been brought up to distrust “bourgeois individualism” and to strive for collectivism. None of its leaders looked immune from the former and as expressive of the latter as Stalin. HE WAS SLOWLY stacking his cards and waiting. The opposition, though again condemned by the thirteenth congress in May, 1924, was still a factor to be reckoned with. The attitude of the Communist International had also to be considered. Dissension among the triumvirs was yet another reason for Stalin’s caution. Not until a year later, in 1925, did they fall out; but even now personal jealousies troubled their relations. Zinoviev and Kamenev began to feel that Stalin was tightening his grip on the party machine and excluding them from control. Stalin was envious of their authority in matters of doctrine. Finally, he was still waiting for the adversary to make the blunders that were inherent in his attitude. Trotsky had accepted the Leninist cult, even though his rational mind and European tastes were outraged by it. The uniform of Lenin’s disciple was, anyhow, too tight for him. The Leninist mystique, however, had already grown too powerful for anybody who wanted to get the hearing of a Communist audience to ignore it, let alone challenge it. Trotsky thus involved himself in fighting on ground where he was weak. The triumvirs hurled at him old anti-Trotskyist quotations from Lenin and, what was even more embarrassing to him, his own strictures on Lenin which he had uttered 12 or 15 years ago. In the mind of the young Communist, the selection of such quotations added up to a picture of Trotsky malevolently opposing Lenin at every turn of events, from the split in 1905 to the debates over Brest Litovsk and the trade unions. In the light of the Leninist dogma, Trotsky stood condemned. Now the operative part of Stalin’s thesis, the thing that was really new and striking in it, was the assertion of the self-sufficiency of the Russian revolution. . . . The Bolsheviks had by now grown accustomed to running an enormous state, “one-sixth of the world.” They gradually acquired the self-confidence and the sense of self-importance that come from the privileges and responsibilities of power. . . . They needed an idea or a slogan that would fully express their newly won self-confidence. “Socialism in One Country” did it. It relieved them, to a decisive extent, of a sense of their dependence on happenings in the five-sixths of the world that were beyond their control. It gave them the soothing theoretical conviction that, barring war, nothing could shake their mastery over Russia. . . . Whoever, like Trotsky, and later on Zinoviev and Kamenev, dwelt on the dangers to the revolution inherent in all those circumstances, offended the complacency of the party. IN HIS ARGUMENT against Trotsky, Stalin appealed directly to the horror of risk and uncertainty that had taken possession of many Bolsheviks. He depicted Trotsky as an adventurer, habitually playing at revolution. For a long time Zinoviev and Kamenev were unaware of the change that had occurred in their partner. They shrugged their shoulders over his quaint insistence on the possibility of fully-fledged Socialism in a single country; but they treated the whole thing as a mere stick with which to beat Trotsky. . . . It was only next autumn, nearly a year after he had put forward his view, that they awakened to its significance and criticized it as the abandonment of traditional Bolshevism in favor of national Communism. Trotsky did not challenge the dogma until 1926, when it had already gained wide acceptance. . . . In January, 1925, Stalin at last brought Trotsky to resign from the Commissariat of War. As the chief of the armed forces, Trotsky had still held a most formidable trump. If he had chosen to stage a military coup d’état he might perhaps have defeated the triumvirs. But he left office without the slightest attempt at rallying in his defense the army he had created and led for seven years. He still regarded the party, no matter how or by whom it was led as the legitimate spokesman for the working class. After Trotsky had thus effaced himself, the only bond that kept the triumvirs together snapped. Soon afterward Stalin took the initiative in breaking up the triumvirate: he refused to consult his partners or to concert with them his moves before the sessions of the Politburo. To all intents and purposes he was the indisputable master of the party, even though Kamenev was still entrenched in the organization of Moscow, while Zinoviev still led the Bolsheviks of Leningrad. Yet, powerful though Stalin’s grip on the party was, he could assert his leadership only in a constitutional way, as the spokesman of a majority of the Politburo. The totalitarian evolution of the party had not yet gone far enough for its members to submit to the undisguised dictatorship of any single leader. . . . Having put an end to the triumvirate, Stalin was now entirely dependent on the backing of three Politburo members: Bukharin, Rykov and Tomsky. Meanwhile, Stalin benefited from the circumstance that Trotsky and the two ex-triumvirs hesitated to join hands against him, although they now had many points in common. . . . It was only after they had been beaten, in the spring of 1926, that Zinoviev and Kamenev at last threw in their lot with Trotsky. Meanwhile, Trotsky, too, had further weakened his position by renouncing his supporters abroad, who had published Lenin’s testament. The union of the two oppositions represented therefore little more than the joint wreckage of their former separate selves.
. . . Stalin knew that the amalgamated opposition could not but flounder on the scruple that had already defeated Trotsky, that it would not carry the struggle beyond the ranks of the party . . . for it accepted the axiom that only a single party could exist in the Soviet state and that if two parties were to compete for influence one of them was bound to play a counter-revolutionary role. Yet the logic of the situation drove the opposition into the role of a separate party. Every step that it made in that direction filled its leaders with remorse and horror. Every such step was retracted and recanted, only to be followed by another that was again to be regretted and retraced. Such an attitude appeared as insincere and dishonest in the eyes of most Bolsheviks; and it could not but dishearten the adherents of the opposition. FOR THE FIRST TIME STALIN now kept the threat of expulsion from the party suspended over his opponents. Anxious to avert it, they retreated. However, having admitted their offenses against the rules of discipline, Trotsky and his associates restated with dignified firmness their political criticisms of Stalin and Bukharin. Now it was again Stalin’s turn to act. Toward the end of October, 1926, he expelled Trotsky from the Politburo. Not a single representative of the opposition now sat on that body. He deposed Zinoviev from the presidency of the Communist International and then indicted him before the Executive of the International, which confirmed the demotion. . . .
To all intents and purposes the opposition was now outlawed, even though Trotsky and Zinoviev, already expelled from the Politburo, were still members of the Central Committee. . . . On November 7, 1927, during the official, celebration of the tenth anniversary of the October revolution, Trotsky and Zinoviev led their followers in separate processions through the streets of Moscow and Leningrad. Though the processions were of a peaceful character and the banners and slogans carried by the demonstrators were directed against the ruling group only by implication, the incident brought the struggle to a head. Trotsky and Zinoviev were immediately expelled from the party. On December 18 the congress expelled 75 leading members of the opposition, in addition to many others already expelled or imprisoned. A day later the opposition split. Its Trotskyist section refused to yield to the demands of the congress. Trotsky was deported to Alma Ata, Rakovsky to Astrakhan. Zinoviev, Kamenev and their followers, however, issued a statement in which they renounced their views. The opposition was defeated by this defection no less than by Stalin’s reprisals. Stalin’s triumph over his ex-partners was far more complete than his victory over Trotsky. THE STORY WHICH FOLLOWED shows in many points so monotonous a resemblance to the one that preceded it that it is hardly worthwhile to tell it in great detail. Stalin’s partnership with Bukharin, Rykov and Tomsky broke down soon after the defeat of their adversaries exactly as the triumvirate had fallen apart after Trotsky’s resignation. . . .
. . . One reason for this pathetic state of affairs lay, of course, in the almost automatic growth of the pressure which Stalin exercised upon the whole political life of the country. The defeat of each successive opposition violently narrowed the margins within which the free expression of opinion was possible. The leaders of each opposition could not get for themselves more elbow room than that to which they themselves, in coalition with Stalin, had reduced their adversaries. After each show-down, actions hitherto regarded as unimpeachable were classed as unpardonable. . . .
. . . Stalin always saw through the hopes and the tactical games of his rivals. He knew that his most dangerous opponent was still Trotsky, whose unbending attitude won him new respect from friend and foe alike. On January 18, 1929, he proposed to tine Politburo that Trotsky be expelled from Russia. The proposal was passed, against Bukharin’s protests. This incident again allows us to gauge the gradualness with which the conflict was mounting toward its bloody climax. In 1929 Stalin still shrank from the imprisonment of Trotsky in Russia—seven years later he would not hesitate to pass a death sentence on him as well as on the whole “Old Guard.” After he had finally removed Trotsky from the Russian scene, he hastened to rout the leaders of the right wing. . . .
Stalin’s ascendancy was now complete. The contest for power was at its end. All his rivals had been eliminated. None of the members of the Politburo would dream of challenging his authority. In the last days of the year Moscow celebrated his fiftieth birthday as if it had been a great historic event. From every corner of Russia tributes were addressed to the Leader. His virtues were praised, immoderately and crudely, by every party secretary in the country. The walls of Moscow were covered with his huge portraits. His statues and busts of all possible sizes filled the squares, the halls of public buildings, and the windows of every shop down to the humblest barber’s shop. “Stalin is the Lenin of to-day,” the propagandists shouted themselves hoarse. Some of the older people recalled Lenin’s fiftieth birthday. It had been a small and modest occasion, which Lenin reluctantly attended only to remonstrate with his admirers for their growing fondness for pomp and ceremony. The new Stalinist cult was now visibly merging with the old Leninist cult, and overshadowing it. When, on ceremonial occasions, Stalin appeared at the top of the Lenin mausoleum in the Red Square, Lenin’s colossal tomb appeared to be only the pedestal for his successor. This article appeared in the March 16, 1953, issue of the magazine.